Today is the sacred festival of Ganesh Chaturthi. 'Ga' symbolises Buddhi (intellect), 'Na' stands for Vijnana (wisdom). So, Ganapati is the master of Buddhi and Vijnana. 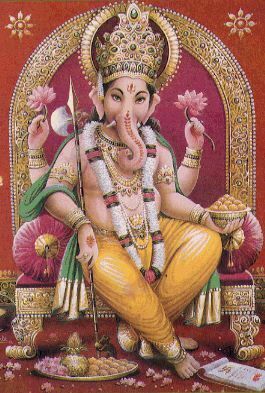 The universe is sustained by Ganas (gods) and Ganapati is their master. In this world, everybody has a master, but Ganapati has none. He is a master by himself. This is the birthday of the Master of Masters. Ganapati is also called Mooshika Vahana (one who has a mouse as his vehicle). You may wonder how a small mooshika can carry on its back a hefty personality like Vinayaka. Here mooshika does not mean a mere mouse. It symbolises the darkness of ignorance because it is in darkness that the mouse moves about. Hence, Mooshika Vahana is one who subdues ignorance and dispels darkness. It is only when we understand the inner significance of the Vinayaka principle that we will be able to celebrate Vinayaka Chaturthi properly. Today people perform Vinayaka worship without actually understanding its significance. Vinayaka symbolises the qualities of a true leader in all aspects. "Viyate Nayake Iti Vinayaka" meaning, He is a master unto Himself. In this world Vinayaka is worshipped by many. However, Vinayaka does not worship anyone as He has no master above Him. Even Easwara, the father, worships His son Vinayaka, but it does not happen the other way. Who is Vigneshwara? Who is Ganapati? The word 'Gana' is related to the intellect. 'Na' refers to wisdom. Ganapati is the head of all the secular and spiritual knowledge. Vinayaka has no master above him. He is the master unto himself. Vinayaka will never put you to suffering in anyway. Vinayaka blesses all your endeavors, efforts and confers success. He will never allow anything evil to reside in you. He has the mouse as his vehicle. A mouse stands for darkness as it moves about in the darkness at night. Vinayaka helps you to dispel this darkness and spread light. Divinity is not limited to mankind alone. We find divinity present in birds and beasts too. To demonstrate this latent, immanent divinity, we have Vinayaka having an elephant's head, with a mouse as his vehicle. The elephant is highly intelligent, faithful and loyal. It never leaves the path that it lays all by itself and stands as a symbol for gratitude. Gratitude is a very sacred quality. Forbearance is Truth, Dharma, Veda, Non-violence, and everything. The elephant has got great patience and forbearance. It is prepared to sacrifice its life, but it can never tolerate its master's suffering. When there is no path for us to take in the jungle, it is the elephant that walks through and creates a path for us. Similarly, in this jungle of life, it is the elephant-headed Vinayaka who shows the ideal path for all of us to tread. On this day of Vinayaka Chathurthi, various kinds of offerings are made. All preparations are cooked in steam and offered to him. They offer him Kudumulu and Vundrallu, made by using rice flour and til seeds, which have no oil content in them. Why is such an offering made? For humanity, heath is wealth. Those who partake food cooked in steam remain very healthy. But today, man is running after various delicacies. But, for the elephant health is all important. Vinayaka, too, teaches us the same. This preparation of rice flour and til seeds frees us from all defects of the eye like spots and cataract. A combination of jaggery and til seeds prevents all defects and diseases caused due to bile, wind and phlegm. The rice flour preparation made using steam helps in digestion too. Vinayaka has many teachings that help man liberate himself. Worship of Lord Ganesha has been followed from very ancient times. In the Narayana Upanishad, Lord Ganesha is praised first. In the three Vedas, we find the mention of Lord Ganesha. Even in music, they pray to Ganesha for his grace. Do we have the qualities of Vinayaka? Lord Vinayaka has a pure heart. In fact, Siddhi and Buddhi (fulfillment and intellect) are his two eyes. He considered them as his consorts. For intelligence, we need to have Buddhi. For Buddhi we need to have gratitude. An ungrateful man can never become an intellectual. Without intellect, one can never be successful. Vinayaka confers success. So, we need to know the inner significance of Lord Vinayaka. Today, before we start any work, we pray to Lord Ganesha. Without praying to the master of masters, Vinayaka, and thereby, acting in an egoistic way, we are bound to fail. Vinayaka Chathurthi is the first festival of the year, followed by other festivals. Bharatiyas begin their daily prayers with a prayer to Lord Ganesha. Vinayaka is the head of spiritual, mental and physical levels. We should sustain and protect all these levels. On this day of Vinayaka Chathurthi, it is the practice of Bharatiyas to prepare delicacies, which are steam-cooked with no oil content and offer them to Vinayaka. These offerings are unique and special. Til seeds, rice flour and jaggery are mixed, made into balls, boiled in steam and offered to Lord Vinayaka. You should enquire into the purpose of making such an offering. These steam-cooked offerings (modaka) are good for the eyes and are beneficial to people suffering from Asthma and Eosinophilia. These offerings are meant to improve health and confer happiness on man. They are not to be treated as mere ritualistic practices. All that is related to God has a sacred inner meaning. Man, unable to understand this truth, treats everything in the worldly perspective. Students worship Vinayaka expecting high marks in the examination. They want to become highly qualified and attain great reputation. But they do not aspire for good conduct and good behavior. They should cultivate qualities, which are dear to God. Before undertaking any task, enquire whether it is pleasing unto God. You are bound to attain success if God is satisfied with your actions. Do not go by your own likes and dislikes. Conduct yourself in accordance with God's wish. Eschew selfishness and self-interest. Cultivate sacredness and steadfastness. This is the teaching of Lord Ganapathi. Ganapathi confers on you Buddhi (intellect) and Siddhi (success). One can attain Siddhi only when one has good Buddhi. You have to love God wholeheartedly and offer Him all that you do. Then even a simple task done looks significant. Consider every day as a sacred day. You do not need to wait for Vinayaka Chathurthi or Navaratri to worship God. Consider every moment as divine and make proper use of it. People do Bhajans without understanding their significance. Instead of focusing their attention on God, they are bothered too much about the tune and the rhythm. No doubt, tune and rhythm are also essential in Bhajans. But once you fill your heart with Divine love, the tune and the rhythm will automatically be taken care of. If you concentrate too much on the tune and the rhythm, you will not be able to think of God. Just as the iron ball cast in fire becomes one with it, your mind should become one with God. Water cannot be separated from milk; likewise, your mind should get merged in God. You should not think that you are separate from God. One who realizes such a principle of unity is a true human being. Do not limit worship of God to festival days alone. Each and every moment should be spent in the contemplation of God. You may think, "If every moment is spent in the contemplation of God, how is it possible to do our work?" Do not distinguish between your work and God's work. Your work is God's work because you are God. It is a mistake to think that all that you do in the prayer hall is God's work and outside it is your work. You should not entertain such feelings of separateness. Consider that your heart is the altar of God and turn your vision inward. One who understands this truth and acts accordingly is a true human being. Ganapathi is the embodiment of Buddhi and Jnana (wisdom). Truth emerges out of wisdom and ultimately leads to Ananda (bliss). This is the teaching of Ganapathi. Who is Ganapathi? He is the Adhipathi (master) of all ganas, five senses, five elements and five life sheaths. Human body consists of five sheaths - Annamaya (food sheath), Pranamaya (life sheath), Manomaya (mind sheath), Vijnanamaya (wisdom sheath) and Anandamaya (bliss sheath). Man progresses only up to Manomaya. He is unable to go up to the sheaths of wisdom and bliss. One has to take refuge in God in order to reach the state of bliss. Ganapathi is depicted as having elephant's head as He is very intelligent. Ganapathi is also known as Vinayaka, meaning one without a Nayaka (master). He is the master of Siddhi and Buddhi. So, one has to pray to Vinayaka in order to acquire Siddhi and Buddhi. You have to make proper use of your intelligence in order to earn the grace of Vinayaka. Shun bad company. Seek good company. Only then will your life be redeemed. You are under the false impression that today is the birthday of Vinayaka, but He has neither birth nor death. He has neither beginning nor end. He is the eternal witness. All the festivals of Bharat are suffused with deep inner meaning. They are highly sacred. Festivals are not just meant for preparing delicious items and consuming them. They are meant to remind us of Divinity. On festival days, you decorate your houses with buntings of green leaves and also you wear new clothes, discarding the old ones. Likewise, you should give up your old rotten habits and cultivate new and sacred ideas. Never disobey the command of God. If you do so, you will ruin yourself like Ravana and Hiranyakasipu. What is that you have to offer to Vinayaka on this day of Vinayaka Chathurthi? Today people spend lot of money in offering various fruits to God. All these offerings are made only as a ritual. Ultimately people themselves consume them! No benefit accrues from making these offerings. Pathram, Pushpam, Phalam and Thoyam - these are the four things that you should offer God. Here Pathram (leaf) means body. This body may wither away at any moment. So never develop attachment towards the body, instead offer it to God. Pushpam (flower} means Hridaya. This flower will never fade away. Mind can be compared to Phalam (fruit) and Thoyam stands for tears of joy. All these four should be offered to God. This is the offering that God expects. What is the meaning of the word Ganapathi. Ga stands for Buddhi(intellect) Nastands for Jnana (Wisdom), which means 'Ganapathi' is the master of intellect and wisdom. Acquisition of knowledge and wisdom amounts to worship of Ganapathi. He has another name 'Vinayaka', because He has no master above Him. He is also called 'Vighneshwara', as He is the remover of all the obstacles and the master of all forms of wealth. The principle of Ganapathi is not an ordinary one. It is the very manifestation of various forms of energy and intelligence. The wisdom of Saraswathi is contained within His belly. We will not have any obstacles, if we undertake any task paying our first respects to Vinayaka. How should we pray to Ganesha? We should not ask for petty things like jobs and other worldly matters. We should pray: Let there be no obstacles in our path. We should ask for Ganesha Himself. Once you have Ganapathi on your side, you will become the master of all. The festival of Vighneshwara is not an ordinary one. All the faculties and power s are latent in Vighneshwara. It is not enough if you pray to Ganapathi only today, you have to pray everyday. We should think of God every moment of our life. We should offer all our actions to God. What is the meaning of the name Ganapathi? Where are the Ganas? What is their form? When you investigate this, you find that the five organs of perception and the five organs of action (Jnaanendriyas and Karmendriyas) are the Ganas. The mind is the master over these ten organs. Buddhi (or intellect) is the discriminating faculty above the mind. The ten senses, the mind and the intellect together constitute the Ganas. In the word "Gana ", "Ga " stands for Buddhi (intellect). "Na " means "Vaijnaana " (the higher knowledge or wisdom). Ganapathi is the Lord of the intellect and the higher knowledge. The question may be asked: Are the intellect and the higher knowledge present in the external world or are they to be found within man? The answer is that he is present within each human being. There is no need to seek for him in the outside world. Ganapathi dwells in every human being in the form of intellect and wisdom. When Ganapathi is described as "Parvathi thanaya ", who is this Parvathi? Parvathi signifies "Prithvi ", Mother Earth. Everyone is a child of Mother Earth. The meaning of "Parvathi thanaya " (son of Parvathi) is that Ganapathi, who is the Lord of the Ganas, is the son of Parvathi, who symbolizes Sakthi (the Divine Energy). The adoration of Parvathi and Ganapathi is not of recent origin. Ganapathi is lauded at several places in the Rig Veda. This clearly shows that Ganapathi is as ancient as the Vedas. In several places Ganapathi is mentioned both in the Vedas and the Upanishads: There are many prayers addressed to Ganapathi in the Narayanopanishad. There are prayers to him in the Thaithiriya Upanishad also. The Ganapathi Gayathri Mantra also figures in the Upanishad. Ganapathi has the appellation Vinayaka because there is no master above him. He is all powerful and independent. What is the inner significance of worshipping the elephant-faced deity? The elephant is a symbol of might and magnitude. The elephant's foot is larger than that of any other animal. The elephant can make its way through the densest jungle. In this way, it signifies the quality of a leader who shows the way for others. The elephant is also known for its fidelity and gratitude. In any circumstance it will not forget its master. Even in its last moments, if it hears the voice of its master it will open its eyes and look for him. It will sacrifice its life for its master. These are the lessons man should learn from the elephant. Intelligence without gratitude is valueless. Every man should be grateful to those who have helped him. If you want to lead a life of happiness, free from troubles and difficulties, you have to pray to Ganapathi, the remover of all obstacles. There is no need to go to any temple. Vighneswara dwells in each one of you as your Buddhi (intelligence) and Vijnaana (wisdom). When you make proper use of your inherent intelligence and wisdom, you will be successful in life. Vinayaka (Ganesha) is one who drives away all sorrows, difficulties and miseries. He is the enemy of all obstacles. He will not allow any obstacles to come in the way. He is the destroyer of obstacles. He confers happiness and peace (on his devotees). He is the master of all these powers (Buddhi and Siddhi). What is this Siddhi (fulfillment)? When there is purity of mind you achieve peace (which is Siddhi). Vinayaka is thus the Lord of Buddhi and Siddhi (the Intellect and Self-Realization). Hence every human being should acquire control over the mind. Vinayaka is the Lord of all learning (Vidya). Does learning mean bookish scholarship? No. Everything pertaining to the cosmos is included in the term learning (Vidya). Walking, talking, laughing, sitting, eating, strolling, thinking - every kind of activity is related to learning. Vinayaka is the master of every kind of learning. Today learning is identified with acquisition of information. But apart from knowledge of the physical world, we have many other kinds of knowledge relating to chemistry, the fine arts and other skills. Vinayaka is the master of every kind of knowledge. Vinayaka is not the one who merely comes to the aid of those who read their books. He helps everyone at every step in life's journey. Who is Vinayaka? In the sloka beginning with the words, Suklaambaradharam Vishnum, only the form of the deity is described. But there is another inner meaning for the name Vinayaka. Suklaambaradharam means one who is clad in white. Vishnum means he is all-pervading. Sasivarnam means his complexion is grey like that of ash. Chathurbhujam means he has four arms. Prasannavadanam means he has always a pleasing mien. Sarvavighnopasaanthaye means for the removal of all obstacles. Dhyaayeth, meditate (on him). Vinayaka is the deity who removes all bad qualities, instills good qualities and confers peace on the devotee who meditates on him. The Vinayaka-principle, however, has only one meaning, which is relevant to everyone irrespective of whether he is a believer or a non-believer. Vinayaka means that he is totally master of himself. He has no master above him. He does not depend on anyone. He is also called Ganapathi. This term means he is the lord of the ganas - a class of divine entities. This term also means that he is the master of the intellect and discriminating power in man. He possesses great intelligence and knowledge. Such knowledge issues from a pure and sacred mind. This knowledge leads to wisdom (vijnaana). Because he is the master of Buddhi (intelligence) and Siddhi (wisdom or realisation), he is described as the Lord of Buddhi and Siddhi. Buddhi and Siddhi are referred to as the consorts of Vinayka. The mouse is the vehicle of Vinayaka. What is the inner significance of the mouse? The mouse is considered as the embodiment of the sense of smell. The mouse is a symbol of the attachment to worldly tendencies (vaasanas). It is well known that if you want to catch a mouse, you place a strong-smelling edible inside the mouse-trap. The mouse also symbolises the darkness of night. The mouse can see well in the dark. As Vinayaka's vehicle the mouse signifies an object that leads man from darkness to light. The Vinayaka-principle, thus, means that which removes all the bad qualities, bad practices and bad thoughts in men and inculcates good qualities, good conduct and good thoughts. Another name for Vinayaka is Vighneswara. Easwara is one who is endowed with every conceivable form of wealth : riches, knowledge, health, bliss, beauty, etc. Vighneswara is the promoter of all these forms of wealth and removes all obstacles to their enjoyment. He confers all these forms of wealth on those who worship him. Vinayaka is described as Prathama Vandana (the first deity who should be worshipped). As everyone in the world desires wealth and prosperity, everyone offers the first place for worship to Vighneswara.